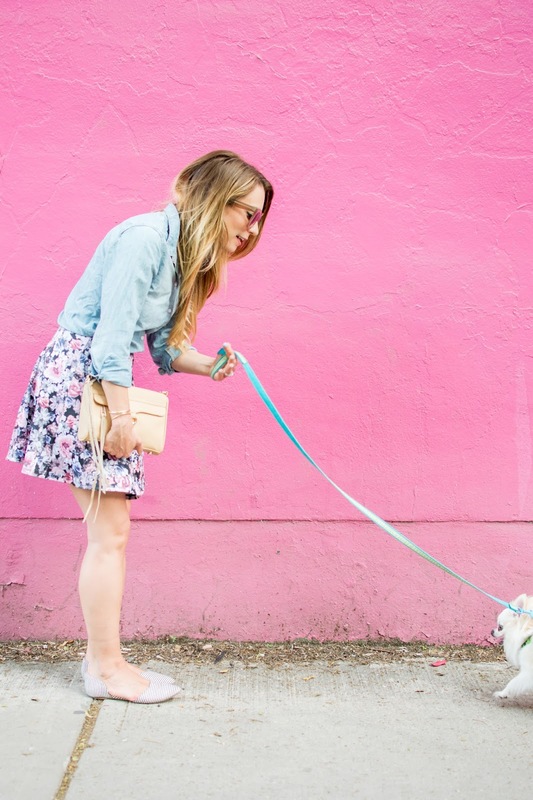 OOTD - The Pink Wall | La Petite Noob | A Toronto-Based Fashion and Lifestyle Blog. So I found a pink wall in my neighbourhood in Toronto. Ever since I spotted the wall on my nightly Fritz-walk, it's been all that I can think of. Take any old outfit and parade it against a pink wall, and you've reached another level - or so I like to think anyways. My classic go-to outfit of a chambray shirt and patterned skirt seems just a little more special, although I can't tell if it's the wall or the fact that the pattern in the skirt is floral. Either way, I'm happy! I've had this Rebecca Minkoff Mini Mac in me collection for some time, and I really love how versatile it is. I find myself removing the strap and using the purse as a clutch often. 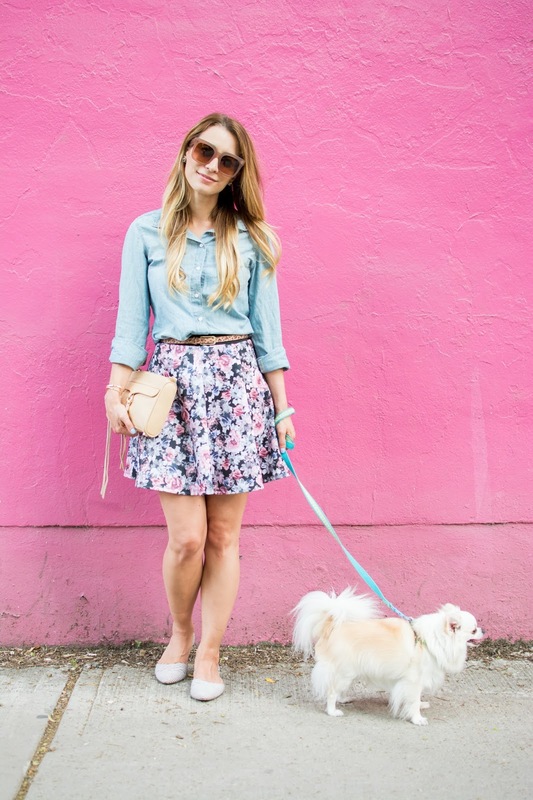 This is just an example of how hard it is to take outfit photos with a stubborn chihuahua. Fritz was in no mood during this photo-session and I think this photo sums up the reality of the situation pretty well. 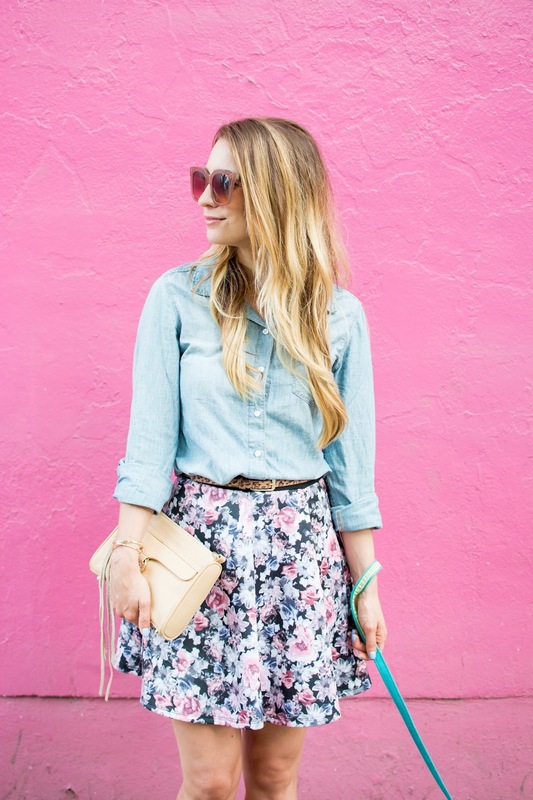 Yay to the pink wall - and a classic go-to outfit! Do you have a special place that you like to visit in your neighbourhood? What about a go-to outfit? Let me know! I found a pink wall this weekend too! I was BEYOND excited. I think I need to find this one, too! 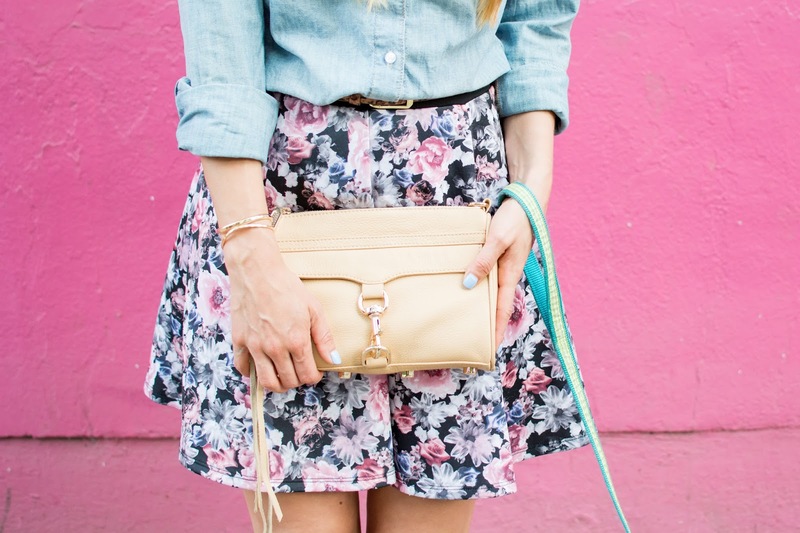 Love the floral and chambray combo! Who doesn't love a pink wall?! I wish I could find one here, haha. You look gorgeous. LOL I definitely did a mental cartwheel when I stumbled upon this wall - oh the life of a blogger, right? Thanks Alecia! I agree that pink makes everything more exciting! I like the mix of prints between your belt and skirt. Good eye! I'm glad you like the leopard and floral as much as I do! Haha I'm always on the hunt for good walls, I just need to get over the fear of looking silly to everyone that passes by while I'm taking photos! This wall and your outfit are absolutely gorgeous! LOL oh the life of a blogger right? I think I've become immune to people staring at me with a confused look in their eye as I pose in front of walls around the city. Thanks for your comment! Hahaha Fritz is soooo not into the photos during this shoot! #FritzSpeaks: Human, how dare you make me wait. HAHA yes!! Fritz hates being kept waiting! where is the pink wall located? where is this pink wall?